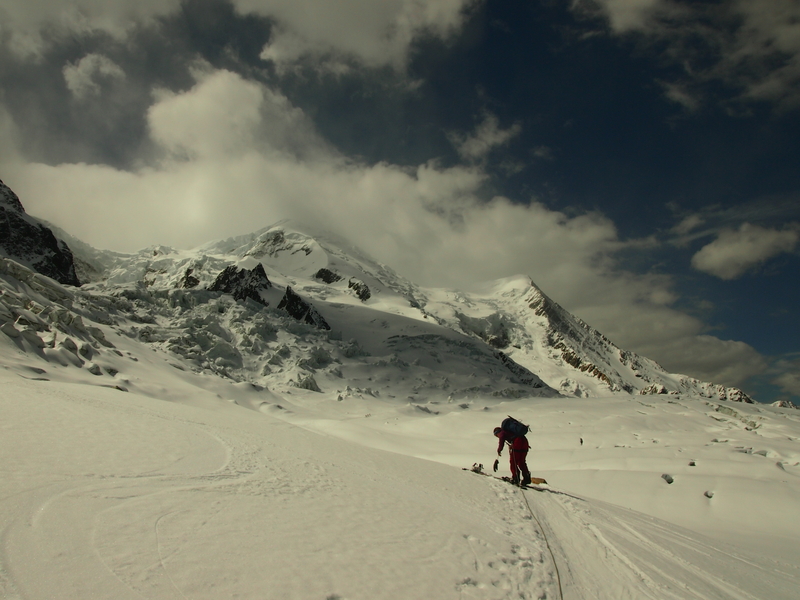 Our attempt to splitboard Mt Blanc was all a bit last minute. It started on Saturday morning when the weather forecast looked good for the next few days and the snow was still looking decent above 3000m. 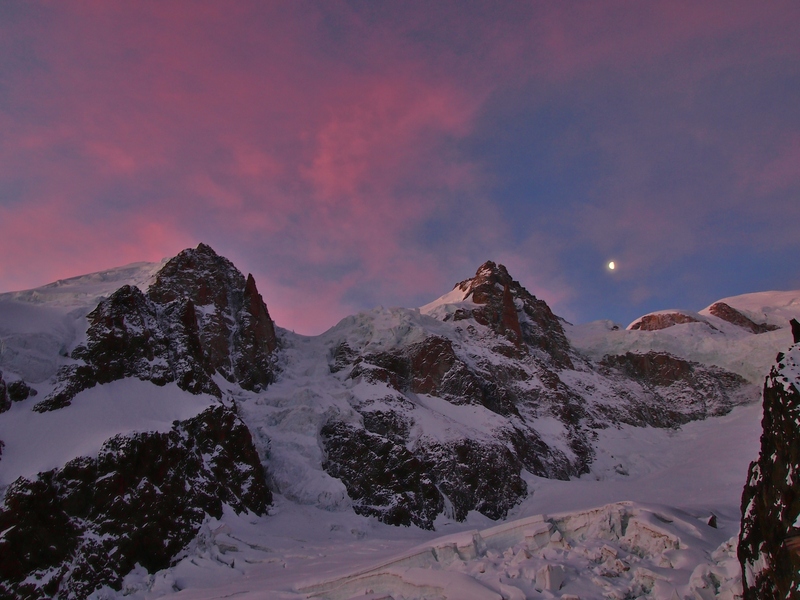 We had hoped to snowboard on Mt Blanc this season but all the elements hadn’t aligned themselves yet. Before we got too prepared, Marion put a call into the Alpine club of France and the Grands Mulets hut had availability on Monday. So we decided to attempt Mt Blanc the next day! Our glacier travel kit and splitboarding gear was hidden in the cupboard for summer, bikes have been at the forefront of our thinking lately. After a bit of rummaging about we had the essentials laid out on the sofa, almost filling our small studio flat in Chamonix Sud. Then after a restless night we awoke to catch the first lift up the Aiguille du Midi. Laden down with food water and general kit we started the long traverse towards the Les Bossons glacier. The snow here has started to slide a lot as the sun catches it later in the day. 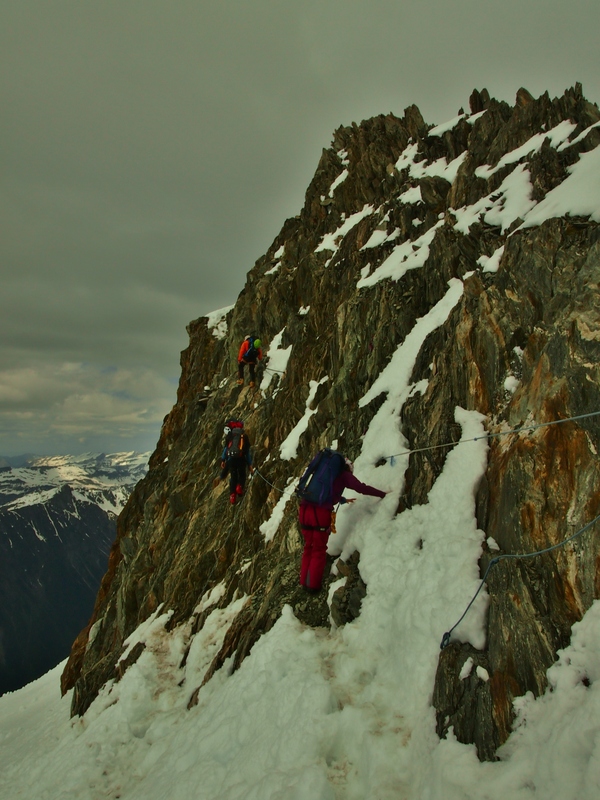 Combined with the ever present rockfall and snow avalanches falling from the Aiguille du Midi above, this can be a dangerous track. To prove this point as we approached the traverse a huge powder cloud avalanche engulfed three ski tourers on the more exposed high traverse that we had avoided, they quickly skied out of the way and were all fine, but certainly warned us how active the slopes above were. 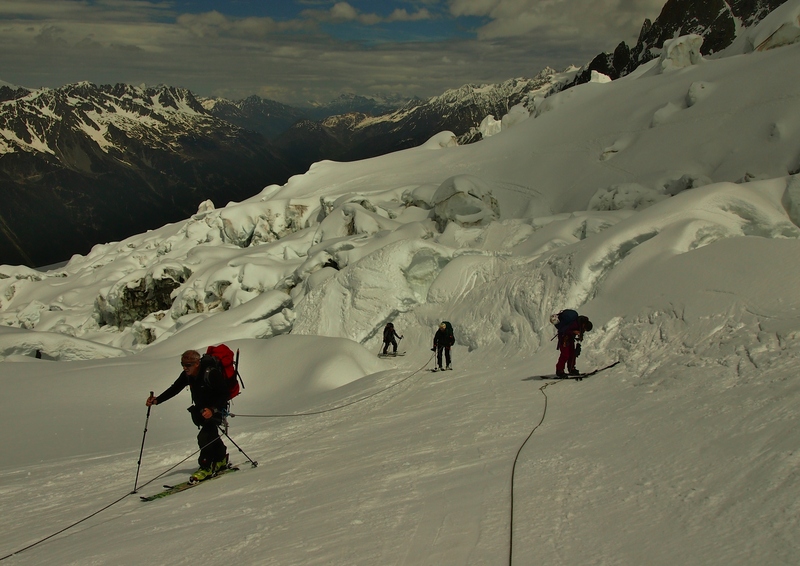 After the final section of the traverse past the old lift station we dropped down onto the glacier itself. There is a flat less crevasse d strip here that is not visible from town. This makes the initial skin track quite pleasant, meandering between gigantic ice sculptures. Next is the Jonction, an area where the two glaciers merge, resulting in an odd mix of crevasses and isolated ice blocks. The track through was tight and too up and down to safely splitboard. We set up an anchor and belayed each other through this section. Jumping cracks revealing gaping chasms below. The slopes up to the Grands Mulets hut are fine but as the day was so hot the snow was very soft. Skinning was getting a bit harder work under the powerful sun and the skis sliding on the wet snow. After much sweating and dehydration, we finally reached the rocky out crop of the hut. All is not over though as the final scramble over snow and rock is pretty exposed, the handrail helps most of the way, but when your tired out it takes more concentration than you might like to get into the hut! The view from this hut is pretty dramatic, across the back is a huge glacier with immense chunks of ice forming seracs the size of apartment blocks. To the front is a view over Chamonix and down the valley to Les Houches and beyond. Below is another shot slightly later during the stunning sunset. After watching the sun set over the mountains we enjoyed a meal and an early night. 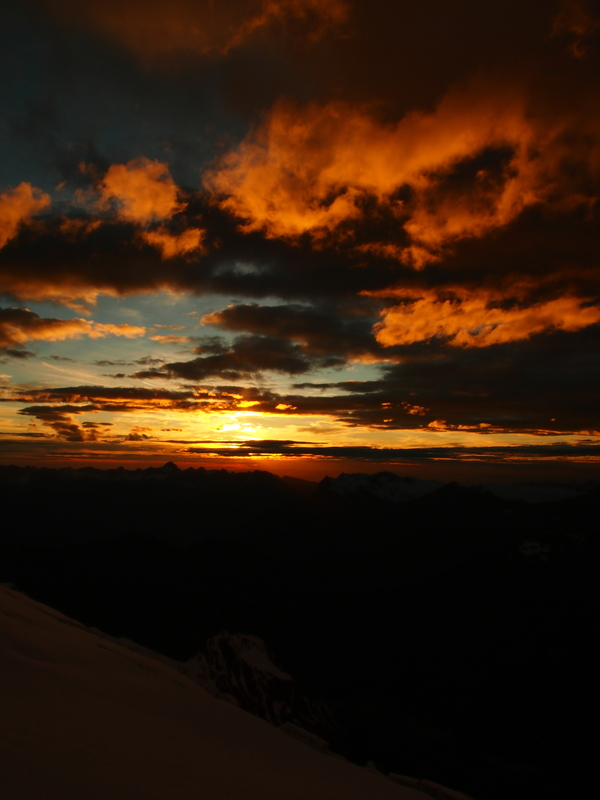 At 1.30am the alarms went off and people started to leave, we looked out and heard the icy crunch under skis. This horrible state of the snow was to be expected after the earlier wet slush in the sunshine, but it would need ski then boot crampons the whole way up. Our planned route was the classic Grands Mulets route under some dicey seracs, that ideally we would pass very quickly. However the crampons combined with the fatigue from the day before would result in a huge amount of time spent under the massive ice bombs above us. Also when the snow is this bad is it really worth lugging a splitboard and associated kit, just to experience a horrible ride down? We therefore aborted the mission to summit and had a much more leisurely day exploring the slopes and heading back towards the Plan d’Aiguille lift station. 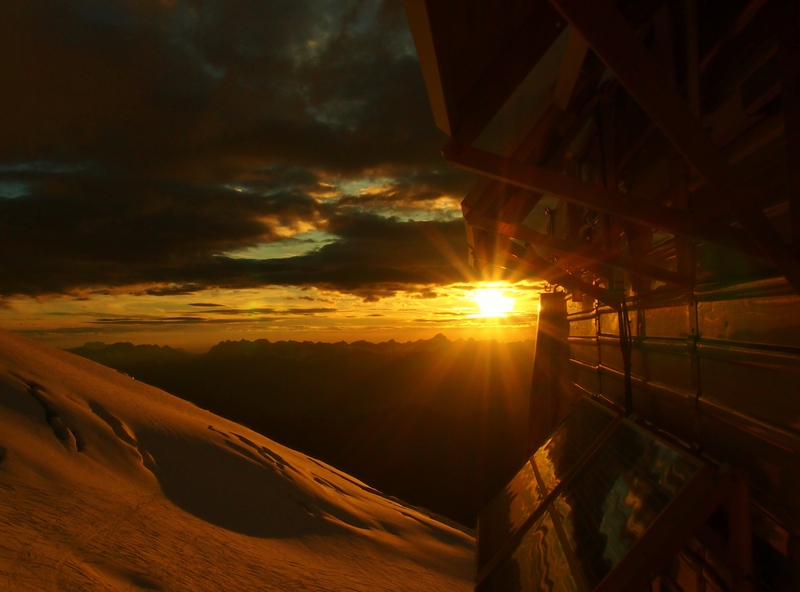 This picture was the sun rising over the Aiguille du Midi peak. The way back was fine, the snow has melted a lot during the previous afternoon and new cracks were appearing in the snow at the Jonction making the exit a bit more challenging. 1. You need to be in slightly better shape than we were! 2. 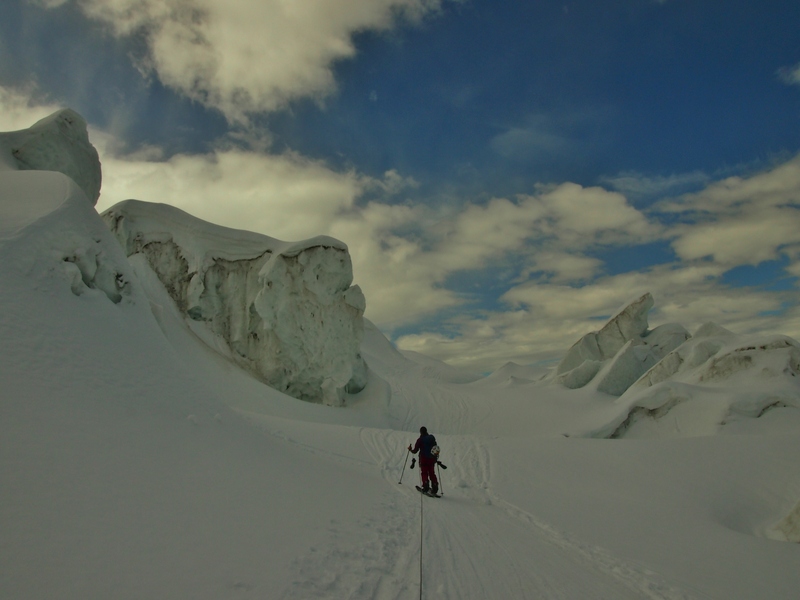 Splitboards are slow and awkward on tricky exposed icy terrain. 3. The Jonction is just way easier with the extra control of skis.